Sep 28, 2008 - O objetivo desse estudo foi verificar o padrÃ£o de excreÃ§Ã£o urinÃ¡ria de ... na urina em relaÃ§Ã£o as concentraÃ§Ãµes na Ã¡gua de consumo. Os. Urinary excretion of apo (a) in patients after kidney transplantation. Dental caries remains a major public health prob- lem in most ... administration of fluoride as part of public health .... 720A fluoride meter (ORION Research Inc.,. Feb 3, 1979 - 20 healthy subjects, 48 patients with stable transplants,. Haemophilia and ..... the skull of a boy, who, notwithstanding the terrible injury was still. Pathology, Rockville, Maryland; 3Office of the Cuyahoga County Coroner, Cleveland, Ohio; 4johns Hopkins School of Medicine,. Baltimore, Maryland; and 5U. Xiao-Chun Le, William R. Cullen,' and Kenneth J. Reimer. We studied ... arsenic varies a great deal with its chemical species. (3-5), the ...... Irvin TR, Irgolic KJ. Youngmee Kim, Miklos Z Molnar, Manoch Rattanasompatikul,. Parta Hatamizadeh, Debbie Benner, Joel D Kopple, Csaba P Kovesdy,. Kamyar Kalantar-Zadeh. a b s t r a c t Aims: Contrast media-induced nephropathy (CIN) is associated with increased morbidity and mortality. The renal endothelin system has been associated with disease progression of various acute and chronic renal diseases. However, robust data coming from adequately powered prospective clinical studies analyzing the short and long-term impacts of the renal ET system in patients with CIN are missing so far. We thus performed a prospective study addressing this topic. Main methods: We included 327 patients with diabetes or renal impairment undergoing coronary angiography. Blood and spot urine were collected before and 24 h after contrast media (CM) application. Patients were followed for 90 days for major clinical events like need for dialysis, unplanned rehospitalization or death. Key ﬁndings: The concentration of ET-1 and the urinary ET-1/creatinine ratio decreased in spot urine after CM application (ET-1 concentration: 0.91 ± 1.23 pg/ml versus 0.63 ± 1.03 pg/ml, p b 0.001; ET-1/creatinine ratio: 0.14 ± 0.23 versus 0.09 ± 0.19, p b 0.001). The urinary ET-1 concentrations in patients with CIN decreased signiﬁcantly more than in patients without CIN (− 0.26 ± 1.42 pg/ml vs. − 0.79 ± 1.69 pg/ml, p = 0.041), whereas the decrease of the urinary ET-1/creatinine ratio was not signiﬁcantly different (non-CIN patients: − 0.05 ± 0.30; CIN patients: − 0.11 ± 0.21, p = 0.223). Urinary ET-1 concentrations as well as the urinary ET-1/creatinine ratio were not associated with clinical events (need for dialysis, rehospitalization or death) during the 90 day follow-up after contrast media exposure. However, the urinary ET-1 concentration and the urinary ET-1/creatinine ratio after CM application were higher in those patients who had a decrease of GFR of at least 25% after 90 days of follow-up. Signiﬁcance: In general the ET-1 system in the kidney seems to be down-regulated after contrast media application in patients with moderate CIN risk. Major long-term complications of CIN (need for dialysis, rehospitalization or death) are not associated with the renal ET system. © 2014 The Authors. Published by Elsevier Inc. This is an open access article under the CC BY-NC-ND license (http://creativecommons.org/licenses/by-nc-nd/3.0/). Introduction Besides chronic renal failure there are also studies indicating that the renal ET system might play a role in the pathogenesis of acute kidney injury. Ischemia–reperfusion injury by bilateral clamping of the renal pedicles for 30 min causes an up-regulation of ET-1 and the ETA receptor in wild-type animals with associated vascular and tubular injuries at 24 h after ischemia–reperfusion injury. Both measures were attenuated in animals with a deletion of vascular endothelial cell ET-1 gene ⁎ Corresponding author at: Institute of Nutritional Science, University of Potsdam, 14558 Nuthetal, Potsdam, Germany. E-mail address: [email protected] (B. Hocher). URL: http://www.uni-potsdam.de/eem (B. Hocher). expression suggesting that the renal ET system might be involved in the pathogenesis of acute kidney injury (AKI) (Arﬁan et al., 2012). Evidence that ET-1 may alter the intrarenal microcirculation in AKI — so supporting ET blockers as a potential therapeutic strategy in AKI — comes from a model of endotoxin-induced AKI. In this case, treatment with an ETA receptor antagonist attenuated the reduction in medullary blood ﬂow independent of changes in systemic blood pressure and total renal blood ﬂow (Fenhammar et al., 2011). Given that ET-1 has effects beyond simply altering vascular tone, other factors may mediate the beneﬁts of ET receptor blockade. These include a reduction in oxidative stress and inﬂammation (Arﬁan et al., 2012; Gulmen et al., 2009). Thus the renal ET system might be critical in the control of microcirculation and oxidative stress during AKI and hence modulation AKI outcome. http://dx.doi.org/10.1016/j.lfs.2013.12.233 0024-3205 © 2014 The Authors. Published by Elsevier Inc. This is an open access article under the CC BY-NC-ND license (http://creativecommons.org/licenses/by-nc-nd/3.0/). non-ionic low-osmolar iobitridol (XENETIX® 350, Guerbet GmbH, Sulzbach/Taunus, Germany) as contrast media. If patients have a higher risk to develop CIN, the physician responsible for this patient gave 0.9% saline solution i.v. with (500 ml before and two times 500 ml after CM examination). Sample treatment and measurement The samples were frozen at −80 °C the very same day. Before freezing blood samples were centrifuged 5 min with 3000 rotates per minutes and only the plasma was frozen. Creatinine was measured according to the method of Jaffé. Cystatin c was measured by an immunonephelometric method using polystyrene particles coated with human cystatin c speciﬁc antibodies (Siemens Healthcare Diagnostics Products GmbH, Marburg, Germany). For the measurement of ET-1 a Quantikine ELISA (DET100, R&D Systems, Minneapolis, USA) was used. Its mean minimum detectable dose is 0.087 pg/ml. No signiﬁcant cross-reactivity of this ELISA is detectable for Big Endothelin-1 (aa 16–38), Big Endothelin-2, Sarafotoxins S6b and-S6c. Endothelin-2 shows 23.4% cross-reactivity according to the manufacturer of the assay. CM: contrast media, GFR: glomerulary ﬁltration rate according to the MDRD formula, SD: standard deviation, ACE: angiotensin converting enzyme, ARB: angiotensin receptor blocker. ET-1: urinary endothelin, uCr: urinary creatinine, CIN: contrast-induced nephropathy, GFR: glomerulary ﬁltration rate according to the MDRD formula, SD: standard deviation. every hospital stay for any reason, which was not preplanned at study entry. however, higher in those patients who had a decrease of GFR of at least 25% after 90 days of follow-up (Tables 2 and 3). The statistical analyses were made with SPSS 20 (IBM® SPSS® Statistics IBM Cooperation, Armonk, USA). Differences among the biomarkers were estimated with Student's t-test for independent or t-test for dependent variables. This prospective study with 327 participants showed a signiﬁcant decrease of the urinary endothelin concentration as well as the urinary ET-1/creatinine ratio after CM application. Death (all cause mortality), need for permanent or transient dialysis or rehospitalization during the follow-up of 90 days after CM application was not associated with urinary ET-1 concentrations — neither before nor after CM exposure. The urinary ET-1 concentration and the urinary ET-1/creatinine ratio after CM application, however, were higher in those patients who had a decrease of GFR of at least 25% after 90 days of follow-up. Urinary endothelin concentrations in humans after CM application Few studies analyzed ET-1after CM application yet. An overview is shown in Table 4. The total number of patients analyzed is far less than the number of patients in our study. Ulas et al. (2013). showed an increase in the urinary as well as in the plasma ET-1 concentrations in only 78 patients. It is of note that the applied contrast media volume was much higher in this study as compared to our study (192 ml vs. 113 ml). However, CM volume matters. This was shown by Clark et al. (1997). They divided their patients into two groups. One got less than 150 ml, the other more than 150 ml CM. Only the group with more than 150 ml had an increase of the ET-1 level. In the small study by Fujisaki et al. (2003) about 100 ml CM were used. They studied two groups, one with normal creatinine levels, the other one with very high levels (2.5 ± 0.5 mg/dl (mean ± SEM)). Only the group with poor renal function had an increase of urinary ET-1 concentrations. ET-1: urinary endothelin, uCr: urinary creatinine, CIN: contrast-induced nephropathy, GFR: glomerulary ﬁltration rate according to the MDRD formula, SD: standard deviation, *test for dependent variables. Iopromid (non-ionic, low osmolar) ? 112 ± 15a 98 ± 18a 100 ± ?a 70–100 ml ? N: number of participants of the study, CM: contrast media, DM: diabetes mellitus, CAD: coronary artery disease, PCI: percutaneous coronary intervention, +: signiﬁcant increase, 0: no signiﬁcant change. a Mean ± standard error of the mean. b Mean ± standard deviation. CM: contrast media, ET: endothelin, MAP: mean arterial blood pressure, L-NAME: N-nitro-L-arginine-methylester, ET: endothelin, GFR: glomerulary ﬁltration rate. RPF: renal plasma ﬂow, CBF: cortical blood ﬂow, OMBF: outer medullary blood ﬂow: pO2: outer medullary oxygen tension. Table 4 Overview over human studies with endothelin measurements after CM application. understood. Maybe they are not close enough to the human situation: Patients getting CIN are typically elderly, have diabetes, heart failure, atherosclerosis, and preexisting renal failure due to chronic renal failure. The animal models are typically young rodents without any co-morbidity. Renal failure is induced in these models with pharmacological tool such as indomethacin etc. These animal models are obviously far away from the human situation. It is thus no surprise that data coming from these experiments cannot be translated successfully to the human situation. We urgently need good translational animal models of CIN. Our clinical study showed that the urinary ET-1 concentration and the urinary ET-1/creatinine ratio after CM application were higher in those patients who had a decrease of GFR of at least 25% after 90 days of follow-up — means the activations of the renal ET system after contrast media-induced AKI related long-term chronic alterations of kidney function. This ﬁts nicely to a recent animal study ischemia-induced AKI in rats showing that long-term activation after ischemic AKI leads to chronic renal failure (Zager et al., 2013). This study is the by far the largest clinical prospective observational study in the ﬁeld. We presented short term outcomes (CIN) and longterm outcomes such as change of GFR after 3 months, death, need for dialysis and rehospitalization during follow-up of 90 days in relationship to urinary ET-1 concentrations as well as the urinary ET-1/creatinine ratio before and 24 h after contrast media exposure. Given the unexpected ﬁnding of a signiﬁcant decrease of the urinary endothelin concentration as well as the urinary ET-1/creatinine ratio after CM application, this study needs to be replicated in an independent second equally sized clinical study. We need to acknowledge that it is a clear study limitation that we did not measure plasma ET-1 concentrations. 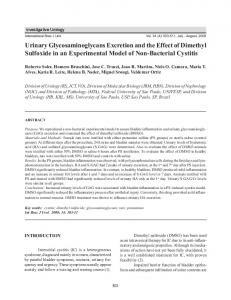 Conclusion Urinary ET-1 and the urinary ET-1/creatinine ratio decrease after CM application. There was no obvious relationship between ET-1 levels and hard outcome such as death or need for dialysis after three months of follow-up. Only a decrease of GFR N 25% after 90 days of follow-up was associated with higher urinary ET-1 concentrations as well as ET1/creatinine ratios. Conﬂict of interest None of the authors has a conﬂict of interest with regard to this paper. References Arﬁan N, Emoto N, Vignon-Zellweger N, Nakayama K, Yagi K, Hirata K. ET-1 deletion from endothelial cells protects the kidney during the extension phase of ischemia/reperfusion injury. 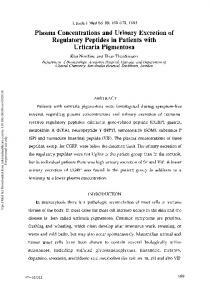 Biochem Biophys Res Commun 2012;425:443–9. http://dx.doi.org/10.1016/j.bbrc.2012.07.121. Briguori C, Visconti G, Rivera NV, Focaccio A, Golia B, Giannone R, et al. Cystatin C and contrast-induced acute kidney injury. Circulation 2010;121:2117–22. http: //dx.doi.org/10.1161/CIRCULATIONAHA.109.919639. Cantley LG, Spokes K, Clark B, McMahon EG, Carter J, Epstein FH. Role of endothelin and prostaglandins in radiocontrast-induced renal artery constriction. Kidney Int 1993;44:1217–23. Fenhammar J, Andersson A, Forestier J, Weitzberg E, Sollevi A, Hjelmqvist H, et al. Endothelin receptor A antagonism attenuates renal medullary blood ﬂow impairment in endotoxemic pigs. PloS one 2011;6:e21534. http://dx.doi.org/ 10.1371/journal.pone.0021534. Fujisaki K, Kubo M, Masuda K, Tokumoto M, Hirakawa M, Ikeda H, et al. Infusion of radiocontrast agents induces exaggerated release of urinary endothelin in patients with impaired renal function. Clin Exp Nephrol 2003;7:279–83. http: //dx.doi.org/10.1007/s10157-003-0246-y. Gomes AS, Baker JD, Martin-Paredero V, Dixon SM, Takiff H, Machleder HI, et al. Acute renal dysfunction after major arteriography. AJR Am J Roentgenol 1985;145: 1249–53. http://dx.doi.org/10.2214/ajr.145.6.1249. Gulmen S, Kiris I, Narin C, Ceylan BG, Mermi B, Sutcu R, et al. Tezosentan reduces the renal injury induced by abdominal aortic ischemia-reperfusion in rats. J Surg Res 2009;157: e7-13. http://dx.doi.org/10.1016/j.jss.2008.08.011. Mehran R, Aymong ED, Nikolsky E, Lasic Z, Iakovou I, Fahy M, et al. A simple risk score for prediction of contrast-induced nephropathy after percutaneous coronary intervention: development and initial validation. J Am Coll Cardiol 2004;44:1393–9. http: //dx.doi.org/10.1016/j.jacc.2004.06.068. Poletti PA, Saudan P, Platon A, Mermillod B, Sautter AM, Vermeulen B, et al. I.v. N-acetylcysteine and emergency CT: use of serum creatinine and cystatin C as markers of radiocontrast nephrotoxicity. AJR Am J Roentgenol 2007;189:687–92. http://dx.doi.org/10.2214/AJR.07.2356. Rihal CS, Textor SC, Grill DE, Berger PB, Ting HH, Best PJ, et al. Incidence and prognostic importance of acute renal failure after percutaneous coronary intervention. Circulation 2002;105:2259–64. Sendeski M, Patzak A, Pallone TL, Cao C, Persson AE, Persson PB, et al. Iodixanol, constriction of medullary descending vasa recta, and risk for contrast medium-induced nephropathy. Radiology 2009;251:697–704. http://dx.doi.org/ 10.1148/radiol.2513081732. Ulas T, Buyukhatipoglu H, Dal MS, Kirhan I, Kaya Z, Demir ME, et al. Urotensin-II and endothelin-I levels after contrast media administration in patients undergoing percutaneous coronary interventions. J Res Med Sci. 2013;18:205–9. Wang A, Holcslaw T, Bashore TM, Freed MI, Miller D, Rudnick MR, et al. Exacerbation of radiocontrast nephrotoxicity by endothelin receptor antagonism. Kidney Int 2000;57:1675–80. http://dx.doi.org/10.1046/j.15231755.2000.00012.x. Yip HK, Wu CJ, Chang HW, Yang CH, Yu TH, Chen YH, et al. Prognostic value of circulating levels of endothelin-1 in patients after acute myocardial infarction undergoing primary coronary angioplasty. Chest 2005;127:1491–7. http: //dx.doi.org/10.1378/chest.127.5.1491. Report "Urinary ET-1 excretion after exposure to radio ..."